Happy St. Paddy’s Day! If you’re looking for a way to celebrate St. Patrick’s Day, then look no further than these Irish Nachos. They’re such a simple gluten-free appetizer and are easy to double to feed a crowd! Can you really go wrong with potatoes, cheddar cheese, and bacon? I didn’t think so. What better way to celebrate St. Patrick’s Day than with a giant plate of these Irish Nachos? They only take 7 simple ingredients, but they sure do pack in the flavor. The options for toppings are endless, but you almost don’t need more because it’s so good as written! These potato nachos are great all year long, not just for St. Paddy’s Day. Whether you need an appetizer to feed a crowd or are looking for a snack while you watch football on TV, you’ll love these Irish nachos. If you’re planning an Irish feast, also be sure to try out my Slow Cooker Corned Beef, Dairy-Free Kale Colcannon, and Leftover Corned Beef Hash! 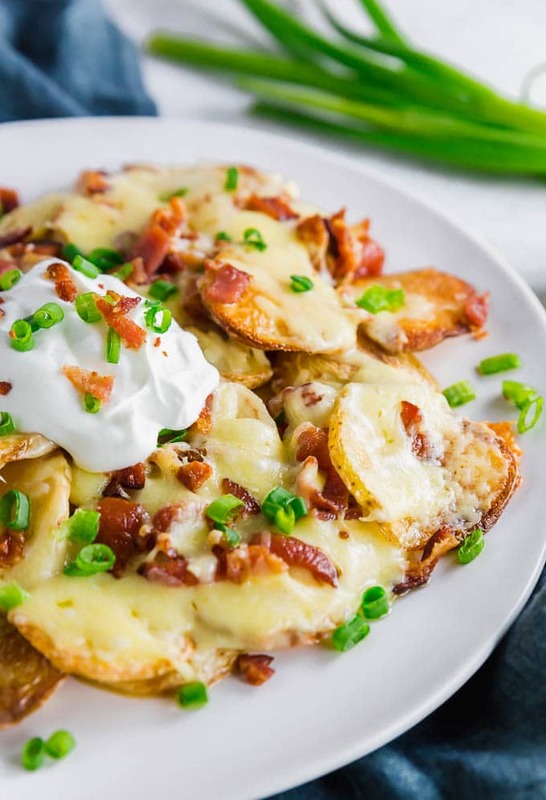 Irish nachos are your typical nachos, filled with melty cheese, bacon, and green onions. However, instead of making the nachos with tortilla chips you use potatoes! I used yellow potatoes, but red potatoes and russett potatoes also work great. You can also change it up and use sweet potatoes, too. Waffle fries and tater tots are another yummy option. Since we’re making Irish nachos, I went with an Irish cheddar for this potato nachos recipe. It’s sharp and a little nutty, which creates a wonderful flavor on top of your nachos. I’d suggest using any kind of sharp white cheddar to get a similar flavor, but honestly use whatever cheese you like to eat. If you’d like to make this recipe dairy-free, use Daiya Shreds for cheezy dairy-free Irish Nachos. This Irish nachos recipe uses crumbled bacon as the main topping. Although, corned beef would be a great option if you have leftovers after making my Slow Cooker Corned Beef! If I’m making this recipe right around St. Patrick’s Day, chances are I have some leftover corned beef in the refrigerator that I can use up on these potato nachos. However, why limit yourself to making these only during March? They’re an amazing gluten-free appetizer or snack all year long! 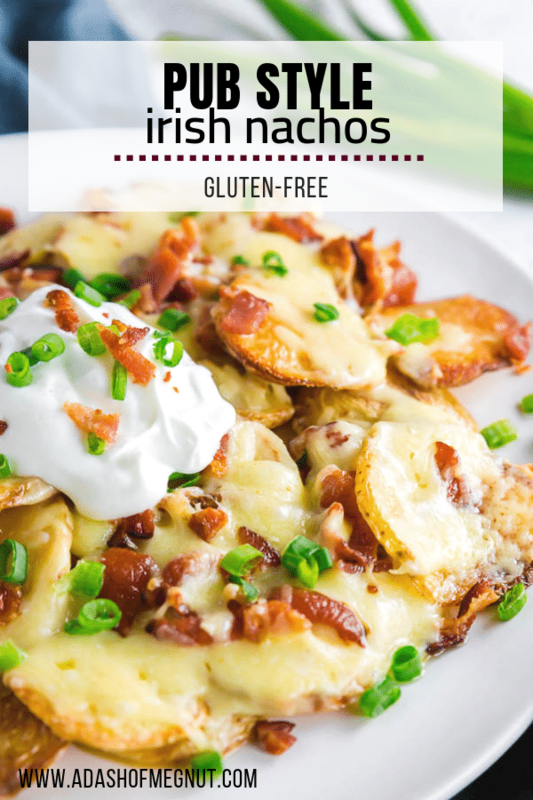 Bacon is something we always have in our refrigerator so it makes the perfect topping to these Irish nachos! I like to cut my potatoes about 1/4-inch thickness. You want to be able to pick the potatoes up and not have them flop over. But, you also don’t want them to be too thin, because the beauty of the bite is in the potatoey goodness if you ask me. You could use a mandolin if you really wanted to, but they tend to be a little on the dangerous side and cut the slices too thin, so I much prefer cutting it with a knife. You’ll also want to try to make sure you get a uniform thickness so that your potatoes cook evenly. After you cut the potatoes, pat them dry with a towel. This helps them adhere to the oil and really crisp up. Potatoes hold a lot of water! While I know it’s another appliance that you have to clean, using a food processor that has a shred attachment to make your cheese shreds is an absolute time saver! especially when you have a whole block of Irish cheese that needs to be shredded! The bacon needs to be precooked before it goes on the nachos. You can cook the bacon however you would like. Since we only need a few slices, I tend to cook the bacon in a skillet. However, if you’re doubling the recipe or prepping bacon for other meals (which is what I did most recently), then cook your bacon in the oven! To cook the bacon in the oven, place the bacon in a single layer on a baking sheet lined with foil. Bake at 400F for 15-20 minutes, until bacon is the perfect crispness. Whenever I’m making large batches of bacon, this is my preferred cooking method. It saves so much time and is so easy! 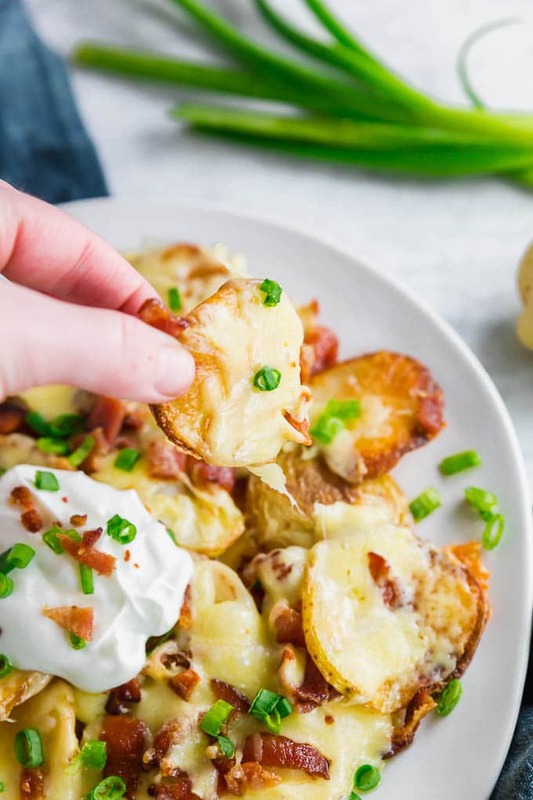 Whether you’re looking for an appetizer to celebrate St. Patrick’s Day or are just wanting a snack for a casual weekend at home, these Irish Nachos are just what you need. 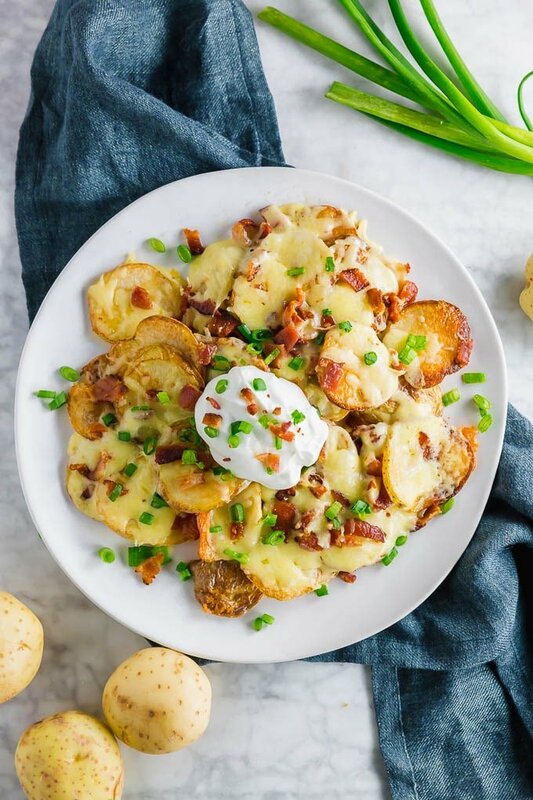 Tender and crispy potatoes get topped with an Irish cheddar, crumbled bacon, green onions and sour cream for an easy gluten-free appetizer. Whether you're looking for an appetizer to celebrate St. Patrick's Day or are just wanting a snack for a casual weekend at home, these Irish Nachos are just what you need. 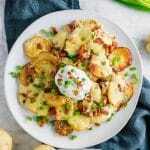 Tender and crispy potatoes get topped with an Irish cheddar, crumbled bacon, green onions and sour cream for an easy gluten-free appetizer. Preheat oven to 425F. Line a baking sheet with aluminum foil. Carefully slice potatoes to a 1/4-inch thickness. Pat potatoes dry with a towel and add to a bowl. Toss with oil. 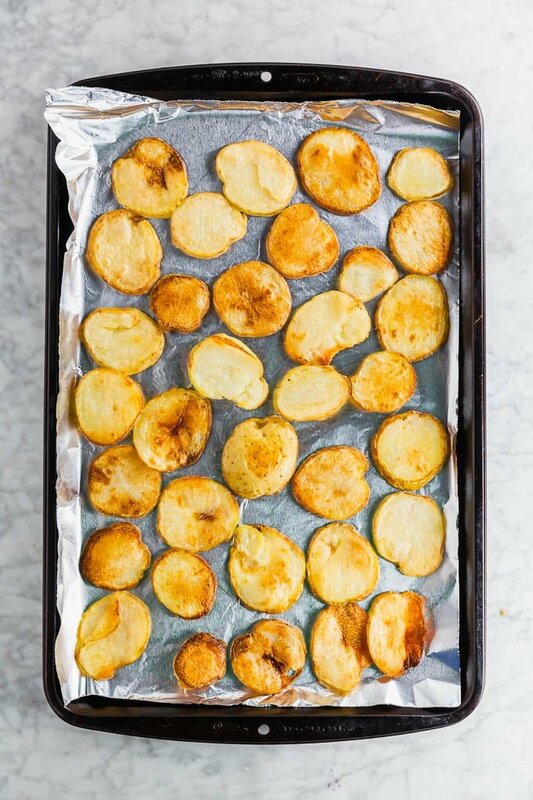 Place potatoes in a single layer on the baking sheet and sprinkle with salt. Bake at 425F for 20 minutes, flip over and bake another 15-20 minutes, until potatoes are tender and lightly browned. Either transfer potatoes to a oven safe plate or cast iron skillet. Place half of the potatoes on the plate, cover with half of the cheese and bacon. Repeat again. Bake an additional 5-10 minutes, until cheese is completely melted. Top with sour cream and chopped green onion to serve.